Like most other Americans last weekend, I went to see The Dark Knight, aka the new Batman movie. Wow, Heath Ledger really does look weird. Scary. And yet strangely…comical. Those wrinkles under that makeup. That lizard tongue. And that voice, that accent, he sounds like someone, I can’t quite place it…. I wonder how Christian Bale gets so hunky and then so skinny over and over again. What kind of diet does he go on? What’s his training regime? I wonder whether that would work for me…. And speaking of thin, Maggie Gyllenhaal looks pretty good. But is she suposed to be the same exact character that Katie Holmes was in the last movie? If Batman’s so powerful, how come he doesn’t notice she’s a different person? Why is that Chinese guy taking all the money to China? And why is Batman going to China to get it back? Why does he care about the bad guys’ money? I’m a little confused though I’m sure it will all come clear. Heath Ledger’s voice. It sounds kind of Midwestern, kind of effeminate. Maybe someone who used to be on TV…. So is Morgan Freeman God? Are he and Michael Caine kind of the same person? Are all old guys in movies wise but deferential supporters of young guys? Should I blog about that? Oh no, I’m really not following this. Maybe if I stop thinking about How Not To Act Old, I’ll pick up the thread. Why, whenever I hear Heath Ledger’s voice, do I think of Carol Burnett? Is Maggie Gyllenhaal dead or alive? Is Gary Oldman honest or corrupt? Is Aaron Eckhart tall or short? Is Gotham City supposed to be New York or Chicago? And who the hell are those people on that boat? On the movie, I totally give up. But Heath’s voice, I’ve got it! He sounds just like this campy gay actor who was on Carol Burnett and then on Hollywood Squares, Paul somebody, Paul Paul Paul: Paul Lynde! I was relieved, when I came out of the movie, to find that my husband had had the same experience. But when we got home and told our 18-year-old son about it, he looked at us like he wanted to take us out behind the garage and put us down now, before we crumbled into dust all on our own. 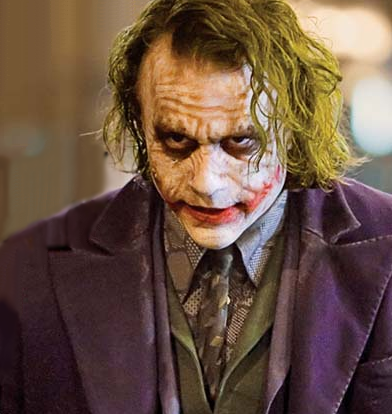 The Dark Knight is a highly revered film, he told us, with “an 82 metascore.” The most esteemed critics on the planet were calling it a masterpiece and Heath Ledger’s performance legendary. Plus, Heath Ledger’s tragic life and early death have put him above criticism, and definitely above ridicule. So obviously we were wrong, due to being hopelessly out of it. The lesson: Don’t admit to any young people of your acquaintance that you are baffled by or hate The Dark Knight. But just between us, on the Paul Lynde thing: Am I right or what?